Hello friends :) Happy Father's Day to you and yours! Today I'd like to show you two polishes from the Brazilian brand Sancion Angel. 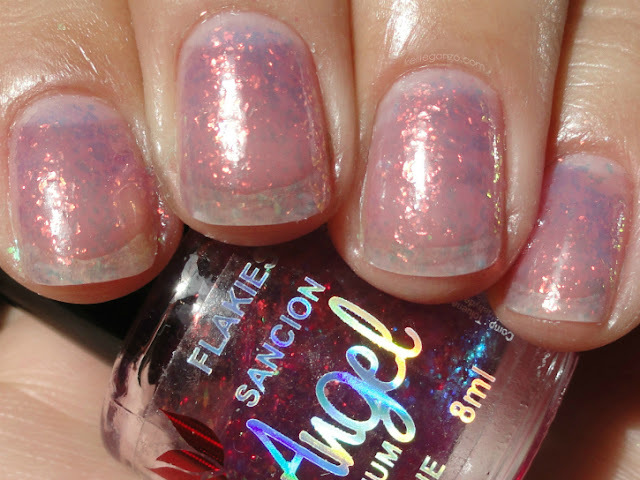 This is their Broadway collection, all flakies too hurrah! The polishes are teeny, 8 ml and named after Broadway characters. Sandy, I imagine is named for the blonde goody-two shoes from "Grease". This polish has a clear base with green tinted flakes, that can appear blue from different angles. This is obviously meant to be a layering polish, but I wanted to show it on it's own to show the flakes better. This is two coats. Christine is named for the singer in "Phantom of the Opera" (I'm guessing), one of my very favorite plays. This is a super gorgeous polish, gold flakes in a violet purple base. Two coats here.